After the expulsion of the Jews from the Iberian Peninsula at the end of the fifteenth century, Italy became the world center of Hebrew printing. Of particular importance was the activity of the Venetian press of Daniel Bomberg (before 1483–1553), a Christian printer from Antwerp. Bomberg established his press in 1516; it was active until 1549. He published standard editions of the Biblia Rabbinica (the Hebrew Bible with translations and commentaries), and of the Palestinian and Babylonian Talmuds. Bomberg’s editions display an attention to textual criticism that would remain the standard for generations. His was also one of the first printing offices in which Jewish and non-Jewish specialists worked together closely, an example that would soon be followed. The Bomberg edition of Rashi’s commentary on the Pentateuch, Song of Songs, Ruth, Lamentations, Ecclesiastes, and Esther is one of a relatively small number of Bomberg editions in the Braginsky Collection. 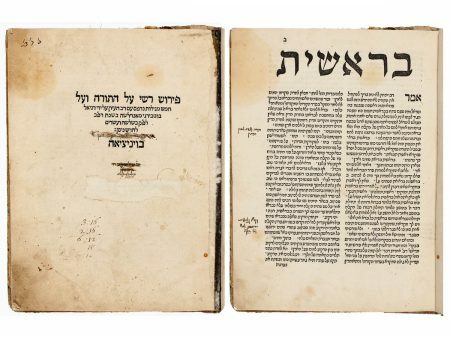 The commentaries of the Bible and Talmud commentator Rabbi Solomon ben Isaac of Troyes (acronym Rashi; 1040–1105) have become so popular that the biblical and Talmudic texts are hardly ever studied without them. Bomberg also included them in his complete editions of these texts, but apparently there was a market for a separate edition as well. Dan 1999; Haberman 1978, no. 71; Printing the Talmud 2005, s.v. ; Scholem 1948, pp. 212–214; Van der Heide 2007, pp. 84–85; Vinograd 1993, Venice 71.